The only downside to trying Peanut Butter Passion first is that it has set the bar very, very high. 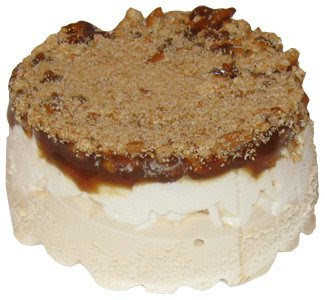 However, this is an ice cream blog, and we have 7 more flavors to get to, so, without further ado, may I present Double Caramel Pretzel Brulee. I've said it before, and I will probably say it again (and again), I LOVE pretzels. 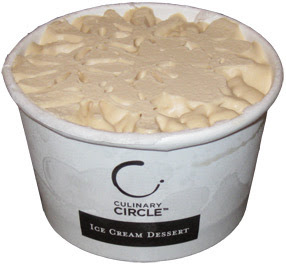 If I was on a deserted island with 2 food choices, I'd probably say ice cream and pretzels ...actually, let's say 3 choices: ice cream, steak, and pretzels. Mmmmm, I'd be happy for a long time. Sorry, started thinking about a nice, peppery, grilled steak ...ok, pretzels, I love pretzels so I was very excited when I saw this as one of the 8 flavors. 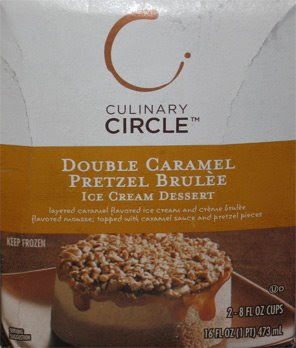 Here we have a major dessert initiative giving props to my buddy the pretzel. Oh yeah, I'm excited. Same swirly pattern design as the other, but I wasn't greeted by any aromas as I removed the paper cover this time. It didn't smell bad, I just didn't smell anything (not that I tried real hard). Time to flip it over and see what's in store. Uh oh, that's not right. The box show pretzel bits, but what I see is pretzel dust. That's ...not really appetizing looking, is it now? I take a taste and it's what I expected: it tastes like salty pretzel crumbs. This is not cool ...well, it's cold, but, you know what I mean. I love pretzel twists and pretzel sticks, thin pretzels and hard pretzels, sourdough and regular, but that does not mean I snarf down the crumbs in the bottom of the bag. In fact, I really don't like pretzel crumbs. My daughter actually got frustrated and just ate the ice cream underneath the pretzel layer. Now, maybe --hopefully-- this is just a side effect of the UPS ride to my house, but if it's not, this is a shame. Or, maybe, I just got a bum treat. As I was eating, I started to think. Now it would probably take some doing, but if they could somehow caramel coat the pretzel, then break them up and sprinkle that on top, it might have a better result. Oh, that reminds me, the pretzel bits were kinda stale too, which just makes the whole mess even worse (but again, a caramel coated pretzel might last longer). Final thoughts? It's well made like the PB Passion, and it's not awful, but there is no denying that execution falls short on the final and most important ingredient: the pretzels. UPDATE: Had a talk with the manufacturer and this is not how the treat is suppose to be. It could be a packaging issue, or something as simple as the UPS ride was a bit rough, but look for an updated review in the near future. My apologies for the rogue sample.